Engaging and building relationships with your Followers on LinkedIn got a lot more powerful today with the launch of Targeted Status Updates. Beginning today, you will be able to share updates to specific subsets of Followers, creating a more tailored and relevant message. Your company’s Followers represent a valuable pool of talent who want to engage with your company and give you the opportunity to shine a light on your employment brand. In fact, 70% of followers on LinkedIn are interested in learning more about relevant job opportunities from companies they follow. We know that relevance is the key to engagement—especially when it comes to capturing the attention of passive candidates—and Targeted Status Updates are another way to provide relevant career information on LinkedIn. With this new feature, companies can now post a status update and target it to select followers based on company size, industry, job function, seniority, and geography to share highly relevant information with their followers. For example, when one of our early release customers VMware wanted to share information about their German operations, they targeted 11,000 of their 58,000 Followers who live in Europe with a customized experience using local language and video. Want to grow your company’s Follower base? Ask us how. Click here for best practices on building relationships with your Followers, or start updating by navigating to the Overview Tab on your LinkedIn Company Page. Want to provide your followers with a best-in-class destination to learn about your employment brand? Click here to learn more about LinkedIn Career Pages. 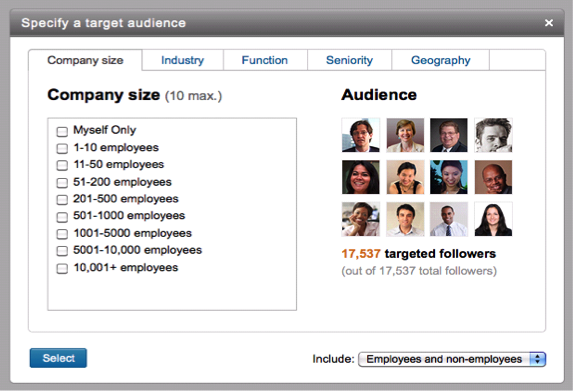 Start using LinkedIn’s Targeted Status Updates and develop your company’s own Follower ecosystem today.